In the 1820s a middle class housewife in Fulham, London, collected recipes and household hints from her friends and relatives and kept them in a notebook. Over 190 years later I found the battered document and transcribed the recipes for this book. Mrs Jean Mills collected receipts for such diverse dishes as veal pie, pillau rice, muffin pudding and English champagne along with face creams, dubious medical remedies, household hints and instructions for growing mistletoe. 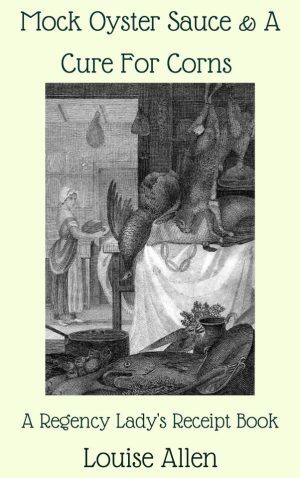 There is a comprehensive glossary of unfamiliar ingredients and methods and the story of Jean Forbes’s journey from a marriage in India through widowhood to a happy second marriage to civil servant and businessman George Mills. This is a fascinating glimpse into middle class social history in the Regency. ¼ lb of Garlic or Shalot, ½ lb Brown Sugar, ½ lb Green Ginger or else Jamaica Ginger fine powdered, 6 oz Raisins Stoned, ¼ lb sliced & dried Green sour apples, ½ lb Salt, 3 oz Chillies, 1 Bottle Vinegar. N.B. The Garlic, Ginger & raisins, Apples, & Chillies to be cut small. The whole to be thrown into a large jar & the mouth covered with a cloth & exposed to the sun for a month or before a fire, being stirred once a week. Then close the jar with a Bung & keep for use. Two pennyworth of Ammonia, ½ lb Pearl Ash or Soda, ½ lb Soft Soap all boiled up together, in a good sized Saucepan of soft water. The article to be scrubbed with the solution & immediately washed with a clean flannel & cold water. Be sure the dust is well beaten out of the carpet before wetted.